The VL-S5 is the successor of TASCAM's popular range of high-quality studio monitors like the VL-X5. Designed for the needs of home studios, it works well with audio interfaces such as our US-2x2 and US-4x4. The design of the VL-S5 creates a high-resolution stereo monitoring system in any environment, You immediately notice the seamless, natural response delivered by the Kevlar woofers and 1" silk dome tweeters. Each component is driven by a separate amplifier, and a crossover frequency of 3.2kHz maximizes the efficiency of both drivers while moving phase issues out of the critical midrange. The system delivers even frequency reproduction from 60Hz – 22kHz. Balanced input connections reduce noise and interface with professional components. 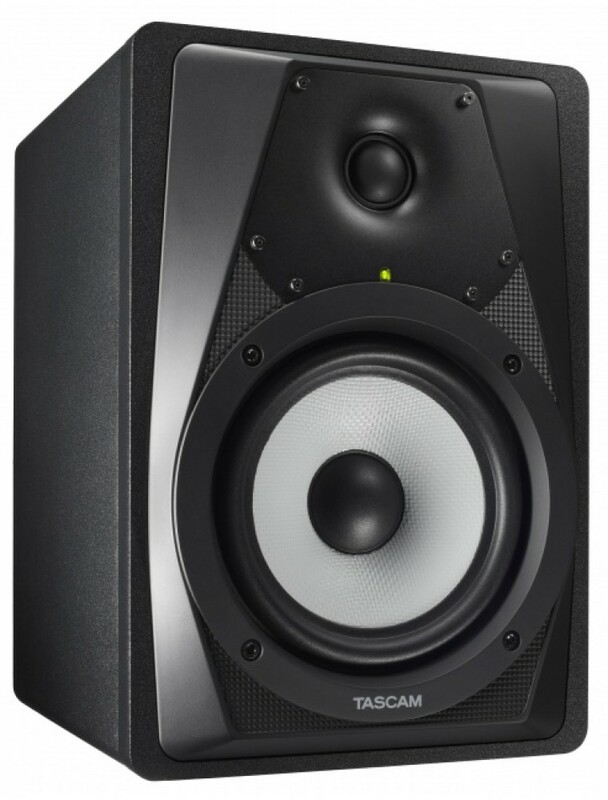 For reliable mix playback at an affordable price, there's no better choice than TASCAM's VL-S5 studio monitors. In the music production process, it is imperative to hear the audio quality of your tracks as purely as they were recorded. The VL-S5 system responds quickly to audio transients with high-quality driver components. The high-strength, heat-resistant Kevlar cone combined with the 1" silk tweeter faithfully reproduce every nuance of the original recorded track. The Kevlar cone reproduces the full frequency spectrum without distortion. Softer materials used in other monitors can bend and deform during playback, giving you an inaccurate idea of what your mix actually sounds like. The silk dome tweeter provides accurate high end playback without the harsh, fatiguing sound typical of metal-domes designs. The VL-S5 is built with transparent audio quality in mind. Each component is driven by a discrete amplifier for the cleanest possible playback. Seperate driving amplifiers also eliminate any possible electrical interaction between components – which could degrade performance. The crossover frequency of 3.2kHz was selected after extended listening tests to ensure that seamless response is achieved. Many monitors place their crossover frequency lower around 1-2k, allowing them to use less expensive components, but this causes phase distortion in the midrange where guitars, vocals, and other critical mix elements lie. The high-quality Kevlar driver allows TASCAM to set the crossover higher without distortion for truer reproduction of rock, hip hop, EDM, acoustic, or any other music genre. Electrically balanced audio connections reduce noise when interfacing audio components, especially when cable lengths are long. Noise can come from other components in the signal chain, the electrical supply to audio components, room lighting, and other sources. Noise can get mixed with signals during transmission between components on a cable, and a balanced connection can reduce or eliminate this noise. To correctly identify whether noise is caused by a previously recorded music track or the environment, noise must be excluded from the monitoring environment. The VL-S5 is shielded to prevent magnetic lines of force from affecting sensitive components nearby. The highly-efficient VL-S5 speaker has a powerful magnet. With magnetic shielding, it can be installed near devices which can be affected by magnetic force - such as computer displays, hard drives, and other computer components. © 2019 Bliaudio. All rights reserved.